MILLIGAN COLLEGE, TN (Feb. 25, 2014) — Milligan College students earned three ADDY® awards this year at the annual American Advertising Federation Northeast Tennessee awards banquet held on Saturday, Feb. 22. The American Advertising Awards honor the best and most creative advertising work from students and professionals in the industry. The awards are given in three levels: local, district and national. Winners in each level are qualified to compete in higher levels. 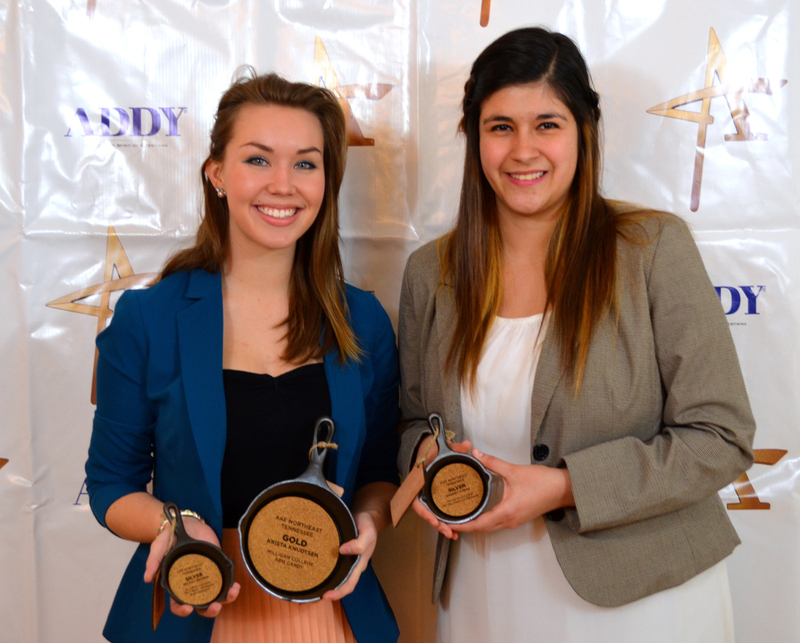 The theme for this year’s awards banquet was “Deep Fried ADDYS” and winners were awarded cast-iron skillets as trophies. Senior Krista Knudtsen of Manila, Philippines, earned a gold ADDY for her stop motion video called “Arm Candy (Take Me Dancing).” Knudtsen is majoring in fine arts with an emphasis in art, and minors in digital media and English. Her winning video will be entered into the district competition and will be judged against entries from Tennessee, Alabama, Georgia, Louisiana and Mississippi. In addition, sophomore Sherry Loera of Matamoros, Mexico, won a silver ADDY for her work on a creative video about her Milligan experience and how the school has shaped her life academically and spiritually. Loera is a communications major with an emphasis in public relations, and minors in business administration and Spanish. Alumnus Mickey Brown earned silver for his photography in Milligan’s “Be a Buff” campaign. Brown graduated in 2013 with a bachelor of arts in fine arts (photography) and is currently working as a photographer for The Band Perry. For more information on Milligan’s communications area, visit www.milligan.edu. Posted by tommy on February 25, 2014.